It seems like washing day rolls around all too quickly but hanging out your clean clothes reminds me of how much I love you. They are also a reminder of how much you’ve grown and what you’ve been up to (and in to). Even though you’ll make them dirty again soon, I love you. Footnote: This was my second post on my blog. I think the whole thing fitted in the reader without having to click on it. I created this photo when my intention was to have ‘I Love You’ in every post. These early posts were written as if I was speaking to my kids. Somewhere along the line my voice started speaking to my fellow bloggers about my boys instead. I think I also got a little bored of the ‘dear diary’ style of writing I was doing. The photo for this took longer than the post, from memory. 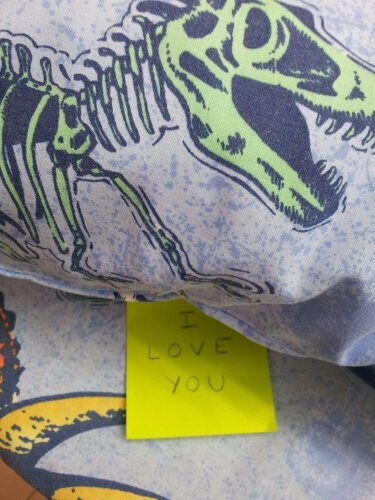 Today I stuck a post-it note under my son’s pillow before he went to bed. Kids look so peaceful when they’re asleep. We say ‘sweet dreams’ and ‘I love you’ to each other every night. I love him when he’s sleeping. Footnote: This was my very first post back on January 1st this year. I don’t know whether to be proud or embarrassed by this post. In reflection, I can’t believe I had so little to say. Like learning to run I guess I had to walk first. A distinct memory is etched in my brain of the very first person to like this post and of how excited I was. That blogger, who has not been seen since, will always hold a special place in my heart. I hope you don’t mind bearing with me as I revert to baby steps while revisiting old posts while my attention is focussed elsewhere. I was maid for loving you. ‘I quit,’ she’ll likely say. shoes left on the stairs. Did I just see something leap? to wipe them once in a while? I’m almost on the brink! before the kids get back. I’ll have to give her the sack. Is it her day off? Images from: here and here. If you were expecting potty training advice or talk of poop and tushies on toilets move along please. This isn’t that sort of post. I’m renaming Sunday as Funday in my jurisdiction (which probably equates to about 1 gazillionth of the world’s land mass). Just three has been in jocks for a while now. He’s still in a nappy (diapers for my U.S. friends) overnight at present but my ‘baby’ is no longer that. We have an abundance of nappies due to my fear of ever running out so I thought we’d put them to good use today. Any speak of toilet-related business ends here. 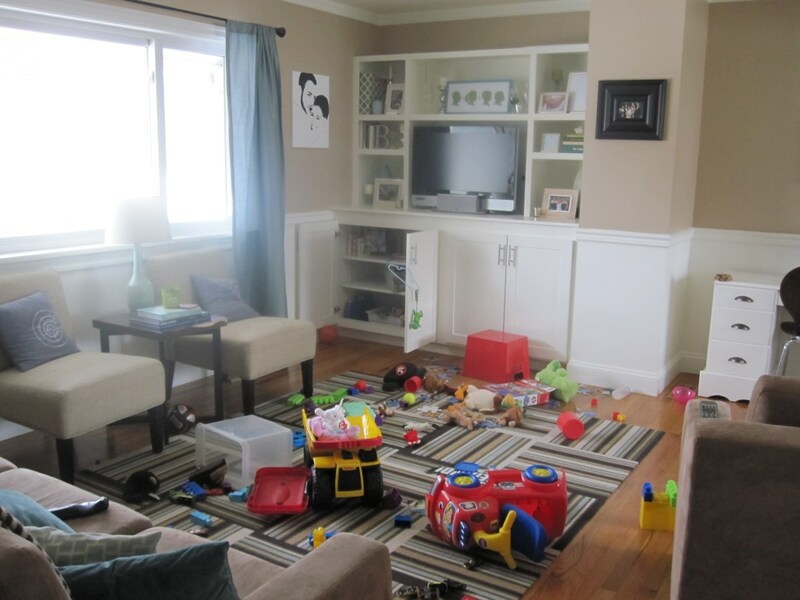 I came into the lounge room where the kids were ‘fighting’ (being Power Rangers or some other such doings) and dumped a load of nappies on the floor. They, of course, looked at me blankly until I stuck one on top of Just 3’s head, did up the tabs and explained that he was now a fighter in a boxing ring. That’s exactly what he looked like with just his face showing! This didn’t stop the fight mentality so I changed tact. Just 3 went and got a teddy and I helped him to put it on. No need to worry about teddy peeing in the bed tonight. Almost 6 wanted one on his head and decided he was a BMX rider so he rode around the room on his imaginary bike. Next were elbow pads and knee pads for riding a scooter. One wrapped around the wrist inside out was good for a tennis player to wipe the sweat from their brow. We rolled one into a ball, fastened it and used it for a soccer ball. I was given a lovely choker necklace to wear. I was told it could also double as a shower cap if I didn’t want to get my hair wet when taking time for my daily ablutions. We fashioned one on the end of a toy sword to make a golf club. This also alleviated the Power Ranger duelling. On feet they made good snow shoes and would stop your socks from getting wet. Wet, inside out and rolled they were better than water balloons-no bits to clean up. Caution-if they ‘burst’ the clean up is worse. 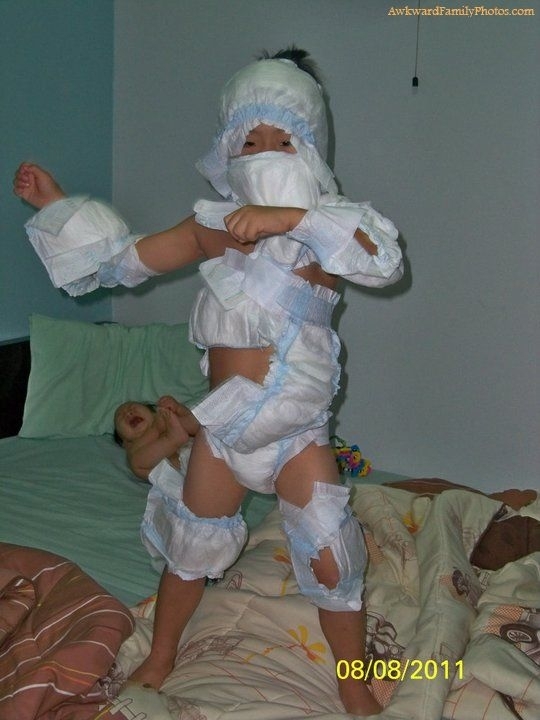 Just 3 ended up looking like a ninja as we attached multiple nappies to his body. He was laughing so much he couldn’t resist. So if you’re a little bored anytime soon and have a few spare ones left in the back of the cupboard, break them out and have fun. No mess, no fuss. If you’re after useful uses for leftover nappies head to Instructables by clicking here. Love your Sunday however you choose. 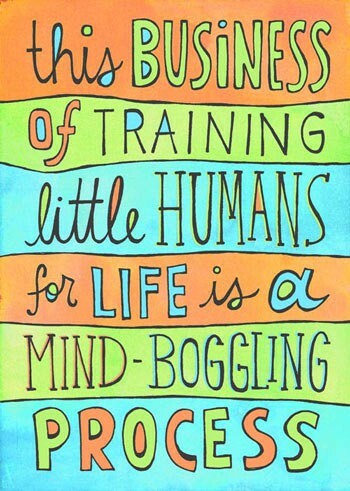 Does your mind boggle when you think about the mammoth task raising children is? Many people seem to think they muddle their way through or follow some type of process. Most also find the need to adapt to the ever-changing needs of their child/ren. I’d like to think that I’m ‘training’ my little fellas using many methods. I couldn’t write a book on it as no one would be able to follow it. All I know is that I use my heart. Yes, I have those moments where I go off my noodle or show less than the required enthusiasm as I drag my heels to 730pm. Those moments are far outweighed by my desire to show the kids that I mean business when it comes to loving them. Recently my brain cells played boggle over Almost 6’s desire to play basketball, soccer and football all through the Winter months. I’ll share my thoughts when the game is finished. What mind-boggling conundrums have you faced? P.S I just noticed boggling rearranged is blogging. How pertinent. These digits love to type. Did you ever notice what primary role your thumb/s play on the keyboard? Mine rest quite neatly on the space bar and happen to do a top-notch job of making sure my writing doesnotlooklikethis. When you think about it thumbs do an amazing job, quite unlike any other. Where would we be in the world of gaming without them? Try using that remote control without your opposable thumb! On a light note, I have a quick story to tell about little. Then there’s the hospital saga with responsible, never-injured Daddy (insert sarcasm here). Note: The latter has some details that some readers who get squeamish easily may want to avoid. Our little one has only just recently mastered the ‘thumbs up’ for a job well done. Prior to this he would point all fingers out with his thumb up in the air. Then we graduated to just his index finger pointing out with his thumb proudly waving the flag. Now he’s got it. All those painstaking attempts to help him make a fist minus his thumb have paid off. Those fine motor skills are coming along nicely thank you! Now only if the boys and I could help teach Dad that thumbs are opposable not disposable. My OH’s recent hospital stay was due to just that. A thumb. While the rest of him was working a-ok his thumb prevented him from being home for three days. Too bad if he’d had to hitch a ride. move date palm frond away from path with hand for children to pass safely. Get date palm needle in top of thumb near knuckle. fall down drain grate up to the knee while running over to little who had fallen and hurt cheek. Extract leg to find bruise from ankle to knee cap (on hospital grounds on Sunday witnessed by several hospital staff). return to work at unknown date as boss is unlikely to allow until splint is removed. So in closing, my OH is nursing himself back to health holding his bourbon, using the lifeline button for the TV and can employ the index finger instead of thumb for console games. I, on the other hand, got 2 hours of child-free time that day followed by almost 3 days flying solo with my kids. Add to that, up to 4 weeks with all of us home and, to be concluded by, Nearly 6 being on school holidays for two weeks as of Monday. Has a smallish injury ever stopped you in your tracks or made a loved one shake their head? Love your work, team. Thumbs up! Since the beginning of this year I have learned with my children how to say ‘I love you’ in several different languages. This was the first time we had tried a language where the written version included symbols/letters I had no idea how to pronounce. We watched a you tube video so we could hear the sounds in each word. I enjoyed trying to perfect the Russian way of expressing love. 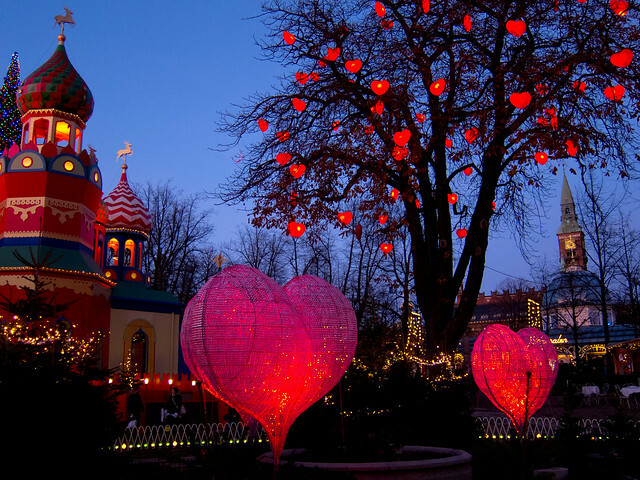 The Russian language fills each syllable with richness and heartfelt meaning. It’s almost as if I can hear Sean Connery speaking them himself to Tatiana Romanova. Er, come to think of it I don’t think any Bond ever whispered those words to his love interest.